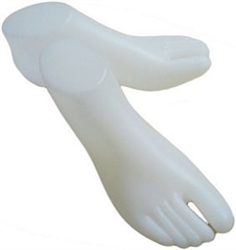 These Fleshtone Plastic Mannequin Male Leg Forms are perfect for merchandising men's clothing. These half body forms are displayed on a square glass base and chrome stand. The legs are easy to remove from the stand allowing for easy dressing. A great choice for women's jeans, shorts, skirts and dress slacks.